So, we’ve been saying that winter is coming for a while but I was definitely a little surprised to peel back the curtains to the first frost of the year this morning! I know it’s November, but the past few weeks have been pleasantly mild so I just wasn’t expecting winter so soon. So much, if I’m being honest, that the thermal layers for all my bike kit were all still at the office… 68 miles away, in Peterborough. I found time for a quick espresso to both warm and pick me up before venturing out to see how the V-Strom had coped with its first night in sub-freezing temperatures. Unfortunately, I’ve no garage at home, so the bike is protected from the elements by an Oxford Products waterproof cover, which does a great job, and fortunately meant there’d be no de-icing necessary. 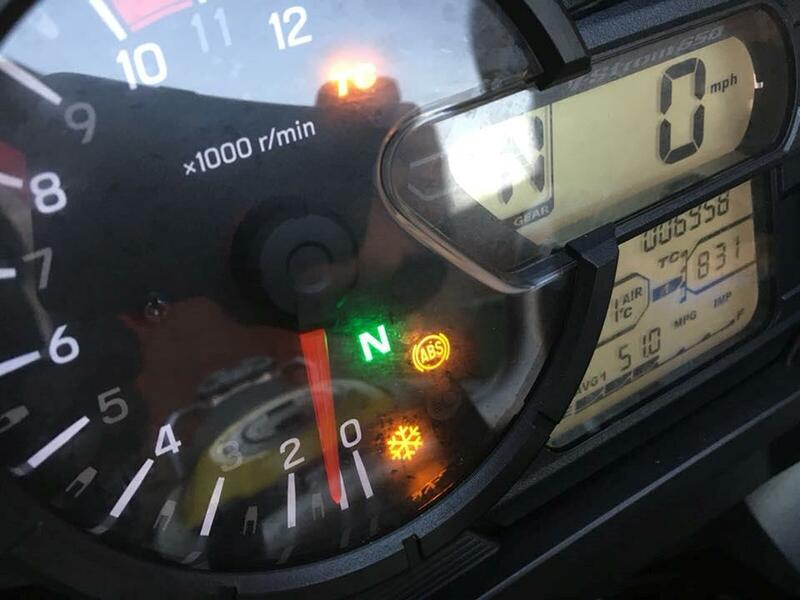 The V-Strom’s temperature gauge read -1 degrees when I turned the key, so I wasn’t wholly surprised that while it did start at the first touch of the starter button it did instantly cut out. Fortunately, a few gentle revs on the start and it was fine. I left it to warm up for a while and whacked the heated grips straight on, it’s the first time I’ve used them on the Suzuki and Suzuki themselves admitted their older heated grips weren’t the best. I wasn’t disappointed, from the minute I stepped on the bike my hands were nice and toasty and it didn’t change when I hit the A1 on my way to work. In fact, five minutes into the journey, the temperature was still three degrees, I actually turned them down from the highest to the middle setting as things were getting a little too toasty. If I’m being picky, for this morning’s ride to work, with the temperature varying between one and four degrees, the highest setting was too hot and the mid-setting wasn’t hot enough, but that really is splitting hairs.